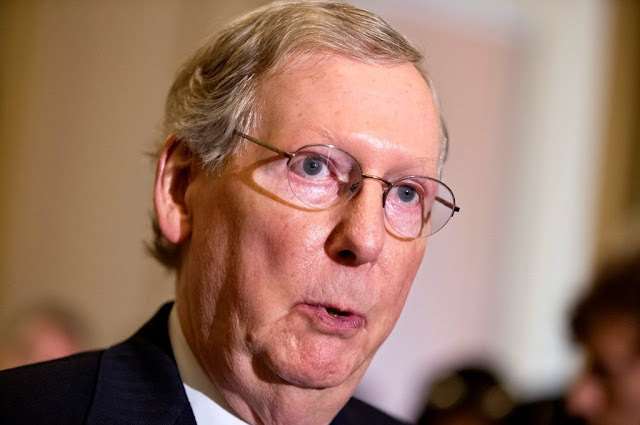 Mitch McConnell and other Senate Republican leaders were poised today to unveil a fresh proposal to repeal and replace the Affordable Care Act, keeping a pair of taxes on high-income people that they had planned to eliminate, reports The New York Times. Republicans said the revised bill would provide roughly $70 billion in additional funds that states could use to help reduce premiums. The bill already included more than $100 billion for such purposes. What a scam, it is putting money in one pocket and taking it out of another but keeping horrific central planning of healthcare at the core. The bill also provides $45 billion to help combat the opioid abuse with statist programs. One positive, the bastards have eliminated the mandate that forces participation by all. They will continue to ruin healthcare but at least we will have some breathing room when it comes to using the socialist system---not much room but some. I'm guessing that the Senators from Kentucky aren't so chummy any more. Which is double plus good. The Democrats go absolutely berserk about any proposed tax cuts for the rich. They clearly do not understand wealth creation. They think there is a fixed lump of wealth and the only way the masses can get some is to tax it or take it. They are hopeless.